It's a really hard decision, because I love each and every fanlisting of mine, especially those I've owned for about 5 years. But I'm getting married and I realize that I won't have much time for fanlistings anymore. I'm keeping only my precious ones, fanlistings which won't be adopted will be closed. So please please please don't resist. Previous owners will be contacted asap. I ADOPTED THE FANLISTING FOR MARK (Love Actually), my favorite character the movie, one of my all time favorites!!!!! No one wants to apply for Smaug? Arthur "Spud" Spudinski from American Dragon Jake Long Adopted! Erika from The Princess and the Pauper Adopted! 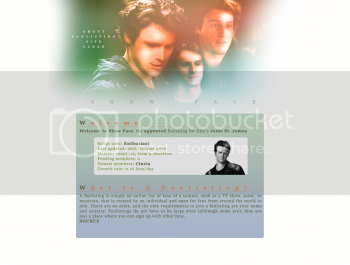 New graphics and layouts for some of my oldest fanlistings, they really needed it! Take a look at the new and improved Luca Argentero and The Animal Instinct fanlistings! Also, Inge let me adopt the Ballet Flats Fanlisting!!!! I opened my first fanlisting today for TV show Body of Proof. If you're a fan of this awesome show come join us! Sadly I need to stop owning and maintaining fanlistings for RL reasons. :( I'm putting everything up for adoption, the first batch is here and includes ABBA, nuts, a lot of music, Buckbeak, Tom Bombadil and other things that I love dearly. *sigh* Please give one or a few of them a good home? I recently opened the Draco Malfoy & Hermione Granger Fanlisting! The fanlisting has 3 graphics you can choose to use, so here's the link with previews of all the 3 graphics! I'm looking for new members and related affiliates! Majestic, for St. Petersburg, Russia. I have several long running fanlistings that I'm giving up. I'd love to find new devoted owners but if none are found, I'll likely be closing them. If you are interested, please e-mail me with the header ADOPT. Please let me know which fanlisting you'd like, your url, examples of other fanlistings you own, and why you want this one. The only rules are that if I give it to you, you have the fanlisting up on your own webhost within 2 weeks. You can keep the layout and codes as long as you give credit. Parker Posey (412 fans) ADOPTED! The Illusionist (146 fans) ADOPTED! I'll be accepting applications until May 31. Since I recently got a lot of wishlisters, I'm letting go some of my fanlistings. I tried to register more than once to the fl.org official forum to adopt them there, but my account never got activated, so I'mgoing to post this only here on LJ. If you want any of these, just comment this post on my LJ or send me a pm here on LJ. - credit me as the previous owner and any previous ones, if existing. ALL THE FANLISTINGS WIL BE CLOSED, so do not esitate! With the arrival of spring, we have decided that it’s time for another TFL Trouble Checker drive! :) We are looking to bring on some additional Green Team members, so if you are interested in becoming a Trouble Checker here are TFL, please go to this page, read the details and fill out the form. Hi everyone! Just to let you know we will be taking the forms down for about half-an-hour tomorrow while our PHP gets upgraded. We have been informed the site may go down, or may be slow while this is going on, so are taking the forms down so nothing gets lost. Recently opened three new "Lost" character fanlistings! Looking for new members and related affiliates! The Walter Skinner (X-Files) character fanlisting has a new URL! Please update any links, and if you haven't already come and join! Thank you to Lorraine for adopting the fanlisting out to me!